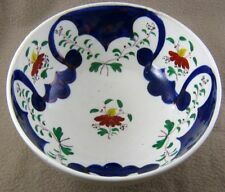 A lovely antique Gaudy Welsh large footed bowl with beautiful moulded design & decorated inside & out. Gaudy Welsh Bowl Perfect. Dispatched with eBay delivery – Shutl 2-3 days. Faded makers emblem underneath. Upper case letter H and numbered 1629 3. 24 cm x 9 cm. Antique Gaudy Style Slop Bowl. LARGE GAUDY WELSH FOOTED BOWL. STILL LOOKS GOOD ON DISPLAY. MINOR USEAGE WARE. SADLY IT HAS 2 PARTS REGLUED AT SIDE AND A MINOR CHIP TO EDGE OF BOTTOM RIM. Antique English Pottery : A Gaudy Welsh Bowl C.19thC. An Antique Gaudy Welsh Bowl with moulded body and scalloped rim. Good Antique Condition. LARGE PRETTY ANTIQUE GAUDY WELSH GREEN FRUIT BOWL 8" 20 CM ACROSS 4 1/2" 11 CM HIGH. DIFFICULT TO SEE DUE TO COLOURFUL INTERIOR. SLIGHT STAIN ON BOTTOM - VERY MINOR MARKS INSIDE - SEE PHOTOS -. Hope you like my stuff (as my wife calls it!). The repair was done prior to this (4th photo shows repair area, though not easy to see unless you know its there).